"David Miliband declines to rule out a return to British politics," Martha Kearney practically exploded with glee. As if it were up to him. As if he could just come back as and when he pleased. Even Roy Jenkins lost the first by-election of his attempted comeback. He fought on, but that would crush Miliband, who has the bigger ego of a smaller man. Jenkins had been away running the European Commission, not some fairly dodgy charity for New York socialites. And he had signalled his intention to return in a Dimbleby Lecture, not in a rabble-rousing excuse for an interview at the Hay Festival. Miliband was a joke during his brief period as Foreign Secretary a decade ago. If people remember anything about him, then it is something to do with a banana. But that has succeeded in distracting attention from his complicity in torture. That complicity ought to preclude his adoption as a Labour candidate, and the Labour Party ought to say so in precisely those words, just as it ought to withdraw the whip from Chuka Umunna. Brexit may or may not serve the interests that the Labour Movement exists to serve. In private, both views on that question are forcefully represented at the very heart of the Corbyn Project. But torture is flatly contrary to those interests themselves. As is the use of unpaid interns. 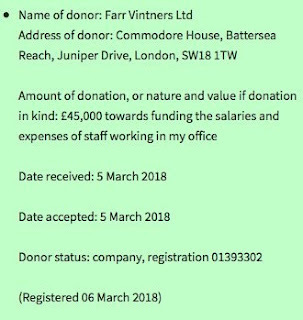 In any case, on 6th March, Umunna registered a donation of £45,000 towards "funding the salaries and expenses of staff working in my office". Wherever did that money go? To return, if we must, to Miliband, this is a job for the man who did eventually remove Jenkins from the House of Commons. This is George Galloway's "Put Up or Shut Up" moment. He needs to state, without ambiguity, that he will contest any seat that is contested by David Miliband, or else that he will never again stand for the House of Commons. Umanna, meanwhile, looks like a job for Marc Wadsworth. Who wants a "British Obama", anyway? Although even Obama has never sided with a lynch mob. Nor is he a slave-driver.